BBC Radio 3 - BBC Proms, 2017, Oklahoma! 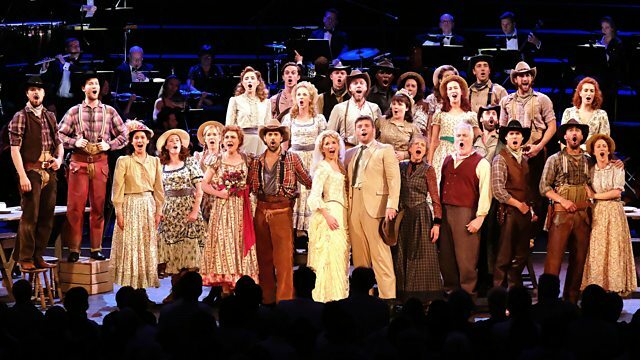 Cowboys and farm girls are let loose in the Royal Albert Hall as the John Wilson Orchestra transports us to the Great American Plains for Rodgers and Hammerstein's first musical. Cowboys and farm girls are let loose in the Royal Albert Hall as the John Wilson Orchestra transports us to the Great American Plains in Oklahoma! Rodgers and Hammerstein's first ever musical was an instant hit when it premiered on Broadway in 1943 and it's not hard to see why - it's chock-full of toe-tapping classics, including Oh, What a Beautiful Mornin', People Will Say We're in Love, and of course the title song itself. With a stellar cast, sensational dance numbers and the unique energy of the John Wilson Orchestra, the magic of the original lives on in 2017. Lyricist: Oscar Hammerstein II. Librettist: Oscar Hammerstein II. Orchestra: John Wilson Orchestra. Conductor: John Wilson.